I got back to New Hampshire at around 3:00 p.m. Sunday; I have been delinquent in my duties at The Hampton Victory Garden. I hadn’t cleaned up the dead marigolds around the sign and some of my perennial flowers needed to be cut back. I also had a bag of tulip bulbs from Allen, Sterling & Lothrop, in Falmouth, Maine. 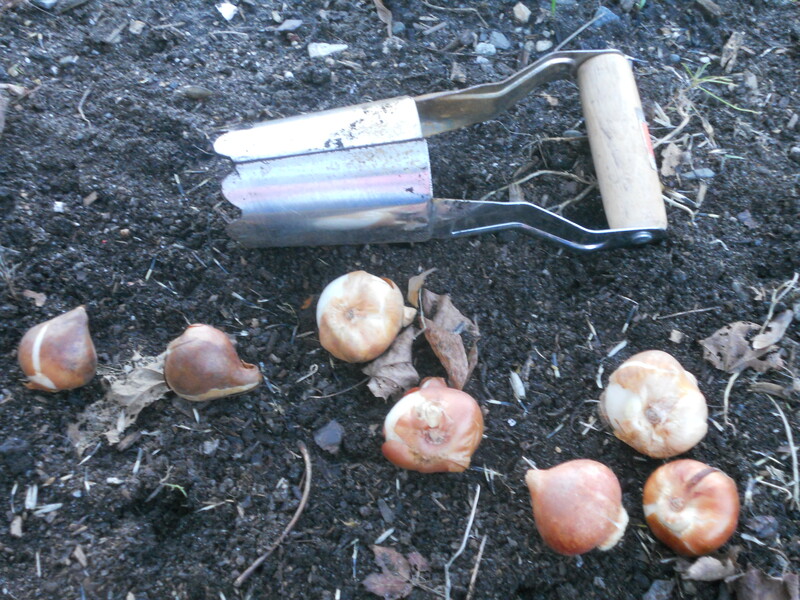 Planting fall bulbs like tulips is a simple process. Dig a hole, put the bulb in with the tip of the bulb pointing upward, cover it up, and wait until spring. Sure, there are planting differences depending on the hardiness zone, but most fall bulbs are as easy as that. Fall bulbs give me hope on long, dull and endless March days. Hurricane Sandy had raised a little havoc in my garden plot; my cold frame had blown over into my neighbor’s garden and my watering can was two plots away from its home. Fortunately, the cold frame wasn’t damaged and I put it back where it belonged. It was quiet and peaceful in the garden. It was too quiet and peaceful. I plugged in my MP3 player and the shuffle brought up Bing Crosby hosting a 1941 holiday episode of The Kraft Music Hall . Der Bingle sings “Adeste Fideles,” first in Latin and then in English, and then encourages everyone listening to sing along with the final English verse. The afternoon shadows and Bing Crosby transported me home in my mind and I laughed thinking about my father and his disdain for the crooner. Every Christmas Eve, we watch Holiday Inn. It doesn’t matter that I fall asleep around the time Jim Hardy (Bing Crosby) and Linda Mason (Marjorie Reynolds) sing “The Easter Parade.” I have a copy of the movie and I can watch it any time I like; I just like to watch it with my father because I know exactly how the Winter Carnival King of 1951’s script is going to run. The movie scene opens with Ted Hanover (Fred Astaire) dancing in the snow and then pans to Jim Hardy (Bing) walking down a hallway, whistling. JAB: Yes, it’s Holiday Inn. Herman: I can’t stand that (BLEEP). Is he dead yet? JAB: Yes, Dad, he’s been dead for a long time. Every Christmas, just like clockwork. It was chilly and thinking about Holiday Inn, I wished I was home. My nose started running a little; I reached in my pocket, but I didn’t have a tissue. I never have a tissue when I need one. When I’m home and I wear one of my father’s jackets, there’s always a tissue in the pocket. I wiped my nose on my sleeve and committed to putting tissues in all the pockets of my jackets and sweaters. I finished planting the tulip bulbs and loaded up the Jeep. Tulip bulbs give me hope on long, dark autumn afternoons. Hurry up and plant some before the ground freezes…for the Easter Parade, of course! This entry was posted in Hampton Victory Garden and tagged Allen Sterling & Lothrop, Bing Crosby, fall bulbs, Fred Astaire, Holiday Inn, Kraft Music Hall, Marjorie Reynolds, tulips. Bookmark the permalink.